Editor’s Note: This preview has been cross-posted at The Siege of Petersburg Online. Also be sure to check out the book’s permanent bibliography page. Taylor, Guy C. & Alderson, Kevin (ed) & Alderson, Patsy (ed). 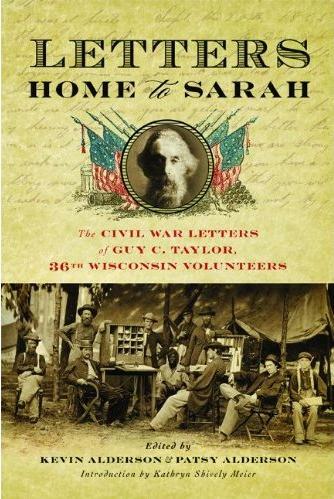 Letters Home to Sarah: The Civil War Letters of Guy C. Taylor, Thirty-Sixth Wisconsin Volunteers. (University of Wisconsin Press: November 2012). 346 pages, 34 b/w photos, 4 maps, endnotes by letter, bibliography. ISBN: 978-0-299-29120-4 $26.95 (Hardcover). My intense and growing interest in the Siege of Petersburg led me to a hidden gem of a book through a daily Google search for “siege of petersburg”. One day on Google reader I noticed a small preview of Letters Home to Sarah: The Civil War Letters of Guy C. Taylor, Thirty-Sixth Wisconsin Volunteers, a lightly edited and annotated collection of letters from Guy C. Taylor to his wife back home. The exciting part for me was that Taylor was present for a good portion of the Siege of Petersburg, much of it behind the front lines in a non-combat role. His unit, the 36th Wisconsin, only mustered in early in 1864, and spent a good portion of its existence at the Siege. Taylor also spent time recovering in Washington, D.C., and some of his letters describe his experiences there while he convalesced. Kevin Alderson’s Preface describes how, much like Katherine Aldridge, he and his wife Patsy stumbled upon a collection of Civil War letters while at an auction. Alderson, a U.S. History teacher, found a box of old letters and excitedly noticed the 1864 date on the one letter he glanced over. This was enough to convince him to bid on, and eventually win, the entire box. What he found exceeded his wildest expectations. Over 100 of Guy Taylor’s Civil War letters home to his wife were in the old box. In what little free time he had, Mr. Alderson started to carefully transcribe Taylor’s letters, picking up considerably after his retirement in 2007. Taylor’s spelling is “eccentric”, to say the least. The Alderson’s chose to retain the vast majority of his misspellings, making exceptions only for the especially confusing ways he spelled off (of), know (now), and own (one). In addition, they attempted to identify as many of the people referred to in Taylor’s letters as possible. A nice touch was a roster of the 36th Wisconsin’s commissioned officers and staff, as well as Taylor’s own Company F.
The advanced readers’ copy (ARC) I received is paperback, but the published form will be available in hardcover and, in a sign of our times, as an e-book. Illustrations abound, and the four functional maps were designed and created by Patsy Alderson. I must say that she did a very solid job when you consider many books of this type contain no maps at all or public domain maps which are carelessly imported over and look horrible. Not so in this case. The sheer number of illustrations also sets this one apart. Readers will get a good idea of the area Taylor frequented in 1864-65, including many images of wartime Washington City and the front at Petersburg and Richmond. Interestingly, in a move that works pretty well, endnotes follow any letter where the Aldersons decided to comment on something Taylor wrote. It isn’t quite footnotes in most cases, but it bundles their additions nicely with the accompanying original letter. The book, published by the University of Wisconsin Press, comes out this November. If you are interested in the view on the ground of a Civil War soldier, this book will deliver. I’ve read the first chapter and it looks like the Aldersons have done a very nice job with this one. A full review and a bibliography page at The Siege of Petersburg Online will follow, probably near the time of publication. Note: The advanced readers copy was provided gratis for the purposes of this preview.